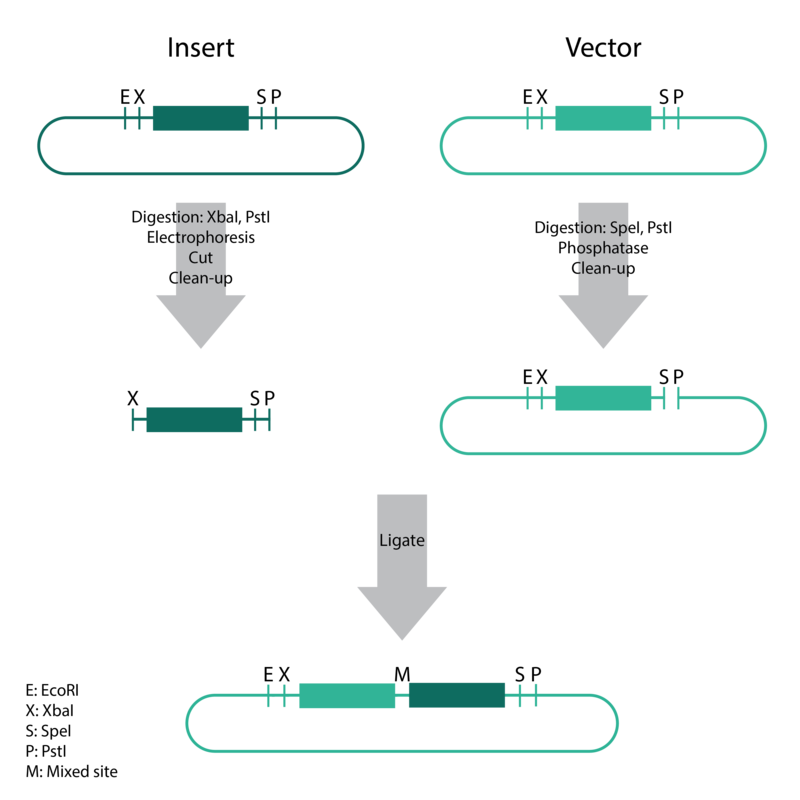 For cloning blunt-end PCR products generated by proofreading DNA polymerases, such as Pfu DNA polymerase. (If the DNA end structure of the PCR products is not specified by the supplier of the DNA polymerase, follow the Sticky-End Cloning Protocol). For cloning of blunt-end DNA fragments generated by restriction enzyme digestion. Gel-purify the DNA fragment prior to ligation and use in a 3:1 molar ratio with pJET1.2/blunt (see Table 1). Vortex briefly and centrifuge for 3-5 s.
2. Incubate the ligation mixture at room temperature (22°C) for 5 min. Note. For PCR products >3 kb, ligation can be prolonged to 30 min. Ligation times longer than 30 min are not recommended and may decrease cloning efficiency. 3. Use the ligation mixture directly for transformation. Note. Keep the ligation mixture at -20°C if transformation is postponed. Thaw on ice and mix carefully before transformation. Resuspend the cells of the plate in 800 µl Buffer P1. Transfer the suspension in small tubes with beads. Use the ribolyser with 6200 rpm 3 x 60 seconds. Centrifuge at top speed for 3 minutes. Transfer 500 µl of the supernatant in a new 2 ml reaction tube. Add 500 µl of Buffer P2 and mix thoroghly by inverting the tube 6-8 times. Add 700 µl of Buffer N3 and mix thoroghly by inverting the tube 6-8 times. Centrifuge at top speed for 10 minutes. Apply the supernatant to the spin column by decanting or pipetting. Centrifuge at top speed for 30-60 seconds and discard the flow-through. Wash the spin column by adding 750 µl Buffer PE. Centrifuge for 30-60 seconds and discard flow-through. Wash again by adding 750 µl Buffer PE. Centrifuge 2 minutes to remove residual wash buffer. Place the column in a clean 1.5 ml microcentrifuge tube. To elute DNA, add 20 µl H2O, incubate at room temperature for a few minutes and centrifuge at top speed for 1 minute. Repeat this step. Following electrophoresis, excise DNA band from gel and place gel slice in a 1.5 ml microcentrifuge tube. Add an equal volume of Membrane Binding Solution to the PCR amplification. Insert SV Minicolumn into Collection Tube. Transfer dissolved gel mixture or prepared PCR product to the Minicolumn assembly. Incubate at room temperature for 1 minute. Centrifuge at 16,000 x g for 1 minute. Discard flowthrough and reinsert Minicolumn into Collection Tube. Add 700 µl Membrane Wash Solution (ethanol added). Centrifuge at 16,000 x g for 1 minute. Discard flowthrough and reinsert Minicolumn into Collection Tube. Repeat Step before with 500 µl Membrane Wash Solution. Centrifuge at 16,000 x g for 5 minutes. Empty the Collection Tube and recentrifuge the column assembly for 1 minute with the microcentrifuge lid open (or off) to allow evaporation of any residual ethanol. Carefully transfer Minicolumn to a clean 1.5 ml microcentrifuge tube. 16,000 x g for 1 minute. Repeat this step. Discard Minicolumn and store DNA at 4 °C or -20 °C. Note: All centrifugation steps are carried out at 17,900 x g (13,000 rpm) in a conventional table-top microcentrifuge. Excise the DNA fragment from the agarose gel with a clean, sharp scapel. Wigh the gel slice in a colorless tube. Add 3 volumes Buffer QG to 1 volume gel (100 mg gel ~ 100 µl). The maximum amount of gel per spin column is 400 mg. For > 2% agarose gels, add 6 volumes Buffer QG. Incubate at 50 °C for 10 min (or until the gel slice has completely dissolved). Vortex thee tube every 2-3 min to help dissolve the gel. After the gel slice has dissolved completely, check that the color of the mixture is yellow (similar to Buffer QG without dissolved agarose). If the color of the mixture is orange or violet, add 10 µl 3 M sodium acetate, pH 5.0, and mix. The mixture turns yellow. Add 1 volume isopropanol to the sample and mix. Place a QIAquick spin colun in a provided 2 ml collection tube. To bind DNA, apply the sample to the QIAquick column and centrifuge for 1 min. Discard flow-through and place the QIAquick column back into the same tube. For sample volumes of >800 µl, load and spin again. If the DNA will subsequently be used for sequencing, in vitro transcription, or microinjection, add 500 µl Buffer QG to the QIAquick column and centrifuge for 1 min. Discard flow-through and place the QIAqick column back into the same tube. To wash, add 750 µl Buffer PE o QIAquick column and centrifuge for 1 mi. Discard flow-through and place the QIAquick column back into the same tube. Note: If the DNA will be used for salt-sensitive applications (e.g., sequencing, blunt-ended ligation), let the column stand 2-5 min after addition of Buffer PE. Centrifuge the QIAquick clumn in the provided 2 ml collection tube 1 min to remove residual wash buffer. To elute DNA, add 50 µl Buffer EB (10 mM TrisCl, pH 8.5) or water to the center of the QIAquick membrane and centrifuge the column for 1 min. For increased DNA concentration, add 30 µl Buffer EB to the center of the QIAquick membrane, let the column stand for 1 min, and then centrifuge for 1 min. After the addition of Buffer EB to the QIAqick membrane, increasing the incubation time up to 4 min can increase the yield of purified DNA. If the purified DNA is to be analyzed on a gel, add 1 volume of Loading Dye to 5 volumes of purified DNA. Mix the solution by pipetting up and down before loading the gel. The volume of TSS to use is 10% of the culture volume that you spun down (we only used 1-2 ml). You may need to vortex gently to fully resuspend the culture, keep an eye out for small cell aggregates even after the pellet is completely off the wall. 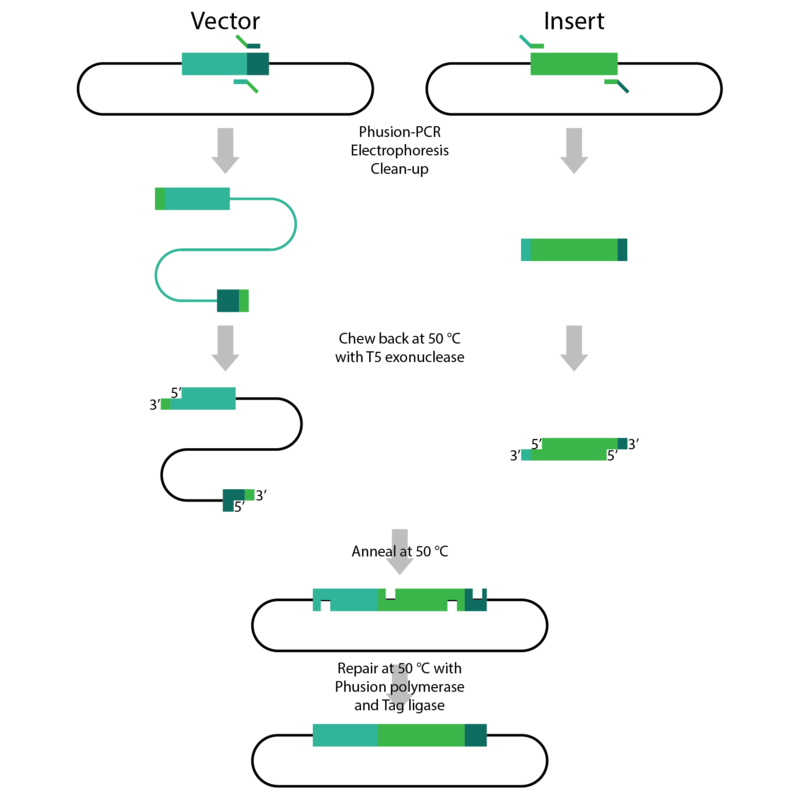 This assembly method is an isothermal, single-reaction method for assembling multiple overlapping DNA molecules. By coordinating the activity of a 5‘ exonuclease, a DNA polymerase and a DNA ligase two adjacent DNA fragments with complementary terminal sequence overlaps can be joined into a covalently sealed molecule, without the use of any restriction endonuclease. Generate the complementary sequence overlaps by PCR using the Phusion DNA-polymerase. If necessary add 5 M Betain in the reaction mix by reducing the amount of H2O to decrease the number of false PCR products. Identify the PCR products of interest by gel electrophoresis with known DNA standards. Extract the PCR products from the gel by cutting out the DNA fragments and clean them up by using a commercial PCR clean-up kit. Thaw 15 µl assembly mixture aliquot and keep it on ice until use. Add 5 µl of the purified DNA molecules in equimolar amounts (between 10 and 100 ng of each DNA fragment). Incubate the resulting mixture at 50 ˚C for 15 to 60 min, with 60 min being optimal. Transformation ( via heat shock or via electroporation) without cleaning up the assembly product. We used the BioBrick Assembly Kit to assemble an upstream part with a downstream part into destination plasmid. Incubate all three restriction digest reactions at 37 °C for 10 minutes and then heat inactivate at 80 °C for 20 minutes. Add 1 μl of AP (Antarctic phosphatase) and 5 µl of 10x AP reaction buffer to digested destination plasmid, incubate for 1 h at 37 °C. Incubate at room temperature for 10 minutes and then heat inactivate at 80 °C for 20 minutes. Transform 1-2 μl of the ligation product into 50 μl of competent E. coli cells. Centrifuge at top speed for 1 minute at room temperature. Discard flowthrough, and reinsert Column into Collection Tube. All purification steps should be carried out at room temperature. (10 000-14 000 rpm, depending on the rotor type). Resuspend the pelleted cells in 250 µl of the Resuspension Solution. Transfer the cell suspension to a microcentrifuge tube. The bacteria should be resuspended completely by vortexing or pipetting up and down until no cell clumps remain. Note Ensure RNase A has been added to the Resuspension Solution. Add 250 µl of the Lysis Solution and mix thoroughly by inverting the tube 4-6 times until the solution becomes viscous and slightly clear. Note Do not vortex to avoid shearing of chromosomal DNA. Do not incubate for more than 5 minutes to avoid denaturation of supercoiled plasmid DNA. Add 350 µl of the Neutralization Solution and mix immediately and thoroughly by inverting the tube 4-6 times. Note It is important to mix thoroughly and gently after the addition of the Neutralization Solution to avoid localized precipitation of bacterial cell debris. The neutralized bacterial lysate should become cloudly. Centrifuge for 5 minutes to pellet cell debris and chromosomal DNA. Transfer the supernatant to the supplied GeneJET spin coloumn by decanting or pipetting. Avoid disburbing or transferring the white precipitate. Centrifuge for 1 minute. Discard the flow-through and place the coloumn back into the same collection tube. Note Do not add bleach to the flow-through. Add 500 µl of the Wash Solution (diluted with ethanol prior to first use) to the GeneJET spin column. Centrifuge for 30-60 seconds and discard the flow-through. Place the column back into the same collection tube. Repeat the wash procedure (step before) using 500 µl of the Wash Solution. Discard the flow-through and centrifuge for an additional 1 minute to remove residual Wash Solution. This step is essential to avoid residual ethanol in plasmid preps. Transfer the GeneJET spin column into a fresh 1.5 ml microcentrifuge tube (not included). Add 50 µl of the Elution Buffer to the center of GeneJET spin column membrane to elute the plasmide DNA. Take care not to contact the membrane with the pipette tip. Incubate for 2 minutes at room temperature and centrifuge for 2 minutes. Note An additional elution step (optional) with Elution Buffer or water will recover residual DNA from the membrane and increase the overall yield by 10-20%. For elution of plasmids or cosmids >20 kb, prewarm Elution Buffer to 70 °C before applying to silica membrane. Discard the column and store the purified plasmid DNA at -20 °C. Note: All centrifugation steps are carried out at 13,000 rpm (~17,900 x g) in a conventional able-top microcentrifuge. Pellet 1-5 ml bacterial overnight culture by centrifugation at >8000 rpm (6800 x g) for 3 min at room temperature (15-25 °C). Add 250 µl Buffer P2 and mix thoroughly by inverting the tube 4-6 times until the solution becomes clear. Do not allow the lysis reaction to proceed for more than 5 min. If using LyseBlue reagent, the solution will turn blue. Add 350 µl Buffer N3 and mix immediately and thoroughly by inverting the tube 4-6 times. If using LyseBlue reagent, the solution will turn colorless. Centrifuge for 10 min at 13,000 rpm (~17,900 x g) in a table-top microcentrifuge. Apply the supernatant from step 5 to the QIprep spin column by decanting or pipetting. Centrifuge for 30-60 s and discard the flow-through, or apply vacuum to the manifold to draw the solution through the QIAprep spin column and switch off the vacuum source. Recommended: Wash the QIAprep spin column by adding 500 µl Buffer PB. Centrifuge for 30-60 s and discard the flow-through, or apply vacuum to the manifold to draw the solution through the QIprep spin column and switch off the vacuum source. Wash the QIAprep spin column by adding 750 µl Buffer PE. Centrifuge for 30-60s and discard the flow-through, or apply vacuum to the manifold to draw the solution through the QIAprep spin column and switch off the vacuum source. Transfer the QIAprep spin column to the collection tube. Place the QIAprep column in a clean 1.5 ml microcentrifuge tube. To elute DNA, add 50 µl Buffer EB (10 mM Tris*Cl, pH 8.5) or water to the center of the QIAprep spin column. Let it stand for 1 min, and centrifuge for 1 min. This assembly method can be used for BioBricks which are bigger than 150 bp. The BioBrick should be at least 500 bp bigger or smaller than the backbone. The BioBrick, which complies with these conditions, is used as the insert and is assembled into the prefix or suffix of the other used BioBrick, called vector. So you have to differentiate between a prefix and a suffix insertion. Digestion of insert: at least 700 ng DNA / 10 µl volume, 1 µl 10x NEBuffer 2.1, 0.5 µl XbaI, 0.5 µl PstI. Digest for 1 h at 37 °C, afterwards inactivation for 20 min at 80 °C. Clean up the insert via gel electrophoresis. When cutting the insert out of the gel try to avoid staining or exposure to ultraviolet light of the insert. Digestion of vector about 700 ng DNA / 10 µl volume, 1 µl 10x NEBuffer 2.1, 0.5 µl SpeI, 0.5 µl PstI. Digest for 1 h at 37 °C, afterwards inactivation for 20 min at 80 °C. Add 1 µl AP (Antarctic phosphatase) and 1.2 µl 10 x AP reaction buffer, incubate for 1 h at 37 °C. Clean up the vector with a PCR clean-up kit. 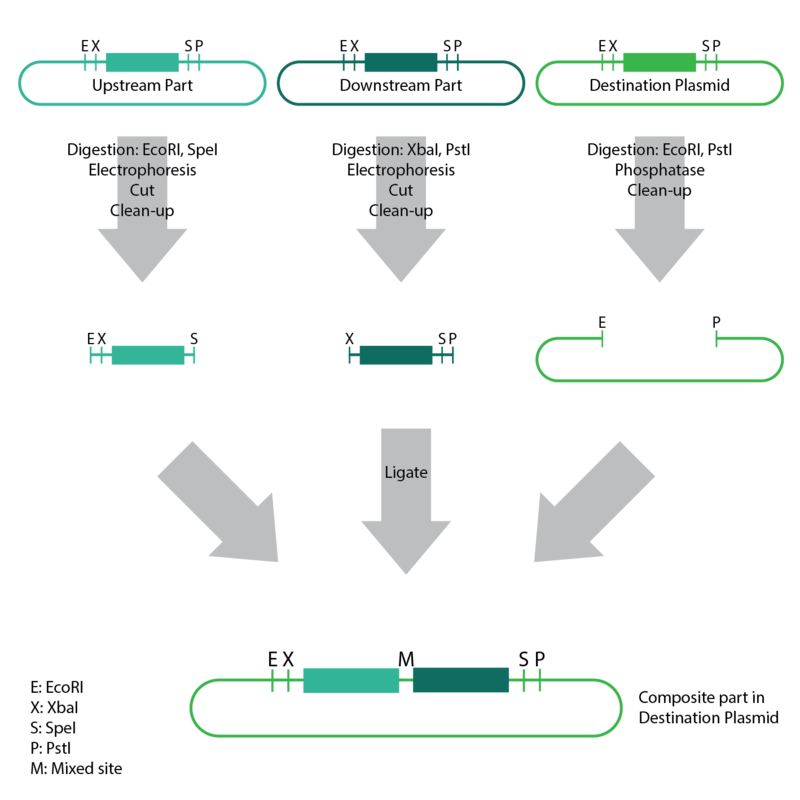 Ligation: after digestion and clean-up: 50 - 200 ng of vector, 3 - 10 fold molar access of insert, 20 µl ligation volume, 2 µl T4-Ligase-Buffer, 1 µl T4-Ligase. Incubate for 20 - 30 min at room temperature, afterwards inactivation for 5 min at 70 °C. Then: store at -20 °C or transform. Digestion of insert: at least 700 ng DNA / 10 µl volume, 1 µl 10x NEBuffer 2.1, 0.5 µl EcoRI, 0.5 µl SpeI. Digest for 1 h at 37 °C, afterwards inactivation for 20 min at 80 °C. Clean up the insert via gel electrophoresis. When cutting the insert out of the gel try to avoid staining or exposure to ultraviolet light of the insert. Digestion of vector about 700 ng DNA / 10 µl volume, 1 µl 10 x NEBuffer 2.1, 0.5 µl EcoRI, 0.5 µl XbaI. Digest for 1h at 37 °C, afterwards inactivation for 20 min at 80 °C. Add 1 µl AP (Antarctic phosphatase) and 1.2 µl 10 x AP reaction buffer, incubate for 1 h at 37 °C. Clean up the vector with a PCR clean-up kit. A digestion over night is possible. If you digest over night use only 0.1 µl restriction enzyme. It is also possible to use PCR product as insert. Digest after PCR with corresponding restriction enzymes and clean up with a PCR clean-up kit. This could lead to higher yields of insert DNA because a lot of DNA gets lost during the gel electrophoresis clean up. Sometimes some BioBricks are hard to assemble. Then you have to clean up the vector by gel electrophoresis as well. To recover the the concentrated solute, insert a pipettor into the bottom of the filter device and withdraw the sample using a side-to-side sweeping motion to ensure total recovery. The ultrafiltrate can be stored in the centrifuge tube. With these settings we generated a calibration line with the following concentrations for further analysis and quantification of our samples. The HPLC was used for substrate analytics. We were able to detect glucose, xylose, succinate and fumarate in the media. Add 2 µl of sodium azide (100g/ L) to each sample. For performing enzyme assays with purified enzymes or crude cell extracts we were using following HPLC-MC system. For the fluorescence microscopy of our GFP targeted carboxysome we used two different miscroscope, a Leica DMI 6000 SD and a structured illumination microscope (DeltaVision|OMXv4.0 BLAZE, GE Healthcare). The preparation of the samples were treated identically. Take 1 ml of the culture (you can choose different time points). Centrifuge at top speed for 5 min. Discard supernatant and resuspend in 600 µl 1x PSB buffer. Prepare your object plates with 1% agarose for a fixation of the cells. Take 5-10 µl of the washed culture for the microscopy (maybe dilute it with PBS buffer before using). We used the NAD/NADH-Glo™ Assay for the determination of the NAD+ and NADH levels in the cells during the cultivation in different growth phases. The 1st step, before the assay can be performed is the lysis of the cells. Assay the neutralized samples using the NAD/NADH-Glo Assay by transferring 30 µl of each sample to the wells of a 96-well white luminometer plate and add 30µl of NAD/NADH-Glo Detection Reagent. Incubate at room temperature and read luminescence after 30 to 60 minutes. Determine NAD/NADH ratios by comparing RLU, or calculate the concentrations by comparison to a standard curve. This method is used, if you want to measure the total amount of NAD+ and NADH. For the determination of the individual NAD+ and NADH concentrations follow the description below. Neutralize R1 with 100 µl trizma base (0.5M). This sample now contains the oxidized form NAD. Both samples can be assayed as already described. This protocol is taken from "Bioluminescent Nicotinamide Adenine Dinucleotide Detection in Bacteria" of the Promega corporation. All measurements were carried out with the GloMax® Discover Multimode-Reader. Induce protein expression using the T7 promotor by adding rhamnose to a final concentration of 0.1 %. When using the ptac promotor, induction concentration is 0,5 mM. Incubate the reaction at 37 °C with continous purge of carbon dioxide. Transfer them into sterile tube containing 10 ml 1.0x IF-0a (mix 8 ml 1.2x IF-0a with 2 ml sterile water) to adjust transmittance to 42 %. This creates solution A. Mix 144 μl Dye Mix A for Gram-negative bacteria and 1.856 ml sterile water with 8 ml 1.2x IF-0a solution. This creates solution B. Mix 1.8 ml of solution A with 9 ml of solution B to achieve a final cell density of 85 % transmittance. This creates solution C.
The membrane needs to be rinsed between the boiling steps and after the final boiling step. After the pretreatment the membrane needs to be stored in deionized water all the time and must not dry. Hole anaerobic work takes place in a two-hand Glove Bag. All media and buffer has to be degased with nitrogen (N2) gas via a sparger befor starting cultivation. Grow preculture under aerobic condition at 37°C. Cells were cultivated in a gas-tight 15 ml tube additional sealed with parafilm. Cultivation volume is about 10 mL. Fill cultivation tube with 8.5 ml steril degased cultivation medium. When preculture reaches OD600 of 0.6-0.8, take 1.5 ml into a steril tube. Centrifugate 1 min at 5,000 rpm and discard complete supernatant. resuspend pellet in 1.5 ml steril degased PBS buffer. Repeat previous step but resuspend in steril, degased cultivation medium. This two steps avoid residual oxygen in the inoculum. Inoculate culture with 1.5 ml washed and resuspended cells at OD600 of 0.1. Tubes are filled and opened for sampling only under nitrogen atmosphere. Tubes are incubated in a shaker at 37°C. At the beginning of anaerobic cultivation residual oxygen from preculture would be consumed. Therefore faster growth could be observed in the first period of cultivation until cells shift to anaerobic metabolism. There should be more frequent sampling at the beginning about 4 to 6-hour intervalls (two times) after inoculation. Regular sampling takes place at 1-day intervalls. Sampling volume is about 1 mL, using 500 μl for OD600 measurement and 500 μl for HPLC analysis. After sampling process tubes are overflowed with nitrogen gas, tightly closed and sealed with parafilm again. Tubes are further incubated in a shaker at 37°C. Induce protein expression using the T7 promotor by adding rhamnose to a final concentration of 0.1 %. When the ptac promotor is used, standard induction concentrations are 0,5 mM or 1 mM.